As stated in the Playbill, the revue-style show used to fill Broadway but now are a dying breed. And there is a reason for it. It’s called content and artistry. Sure, not everything passes as good on Broadway but to even take a trip on the Great White Way there needs to be some sort of substance. So thankfully for the Trip of Love team there are smaller stakes involved because what creator James Walski has on his hands is a big ol’ flop. 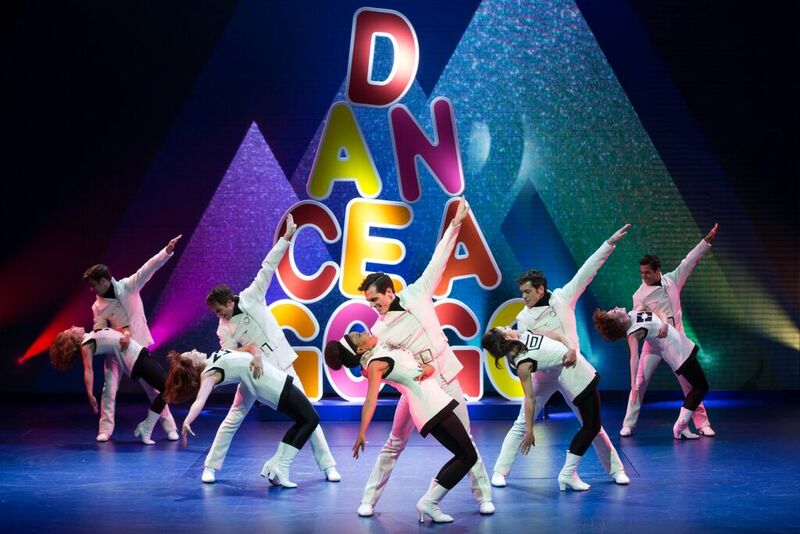 Trip of Love is a 60s infused musical revue. The show hops around the decade of hits and jumps from song to song with a story that is as thin as some of costumer designer’s Gregg Barnes fringe details. Don't let James Walski fool you into thinking there's a plot. He begins by suggesting we’re about to watch some psychedelic “Alice in Wonderland” jukebox musical, but a couple songs into it, it gets wiped out. Literally. The Surfaris tuner wipes out the wonderland world. The revue-style structure is perfect for the nostalgia-loving matinee crowd who just want to hear the tunes. But Trip of Love doesn’t quite meet the mandates of what New York theater truly needs right now. Regardless, the content is just sad. Bouncing from the jovial happy times to the psychedelic drug-infused bits to hippie overload to the angsty commentary on the Vietnam war, Trip of Love offers absolutely nothing that hasn’t been attempted before. Each song that Walski pigeonholed into his attempt at a narrative turned into an on the nose production design. Sometimes it worked, like in “Wipe Out”, and sometimes it offered the biggest laughs of the night, like in “Moon River” and “Up, Up and Away” and “Downtown” and, well the list goes on. Walski gives the main cast of performers character names in attempts to find a story. But don’t let that fool you, Adam, Angela, Caroline, Crystal, George, Jennifer, Peter, and the girl from Ipanema are literally never referenced. Not even cleverly through song. Well, the Girl from Ipanema was but she wasn’t really in the main cast. The formula was pretty standard. But what was more shocking than the song Walski haphazardly thrust at you in some bizarre concoction was when the attractive male ensemble appeared on stage with clothes on. Talk about objectification. The male ensemble, all super-fit, chiseled young men, seemed to be constantly shirtless or have their chest exposed in nearly every single number. Those moments of full clothing allowed the audience to catch their breath. It’s so unfortunate that the stage was filled with such immense talent, forced to entertain with such horrid material. Most of the talent though came from the ensemble. 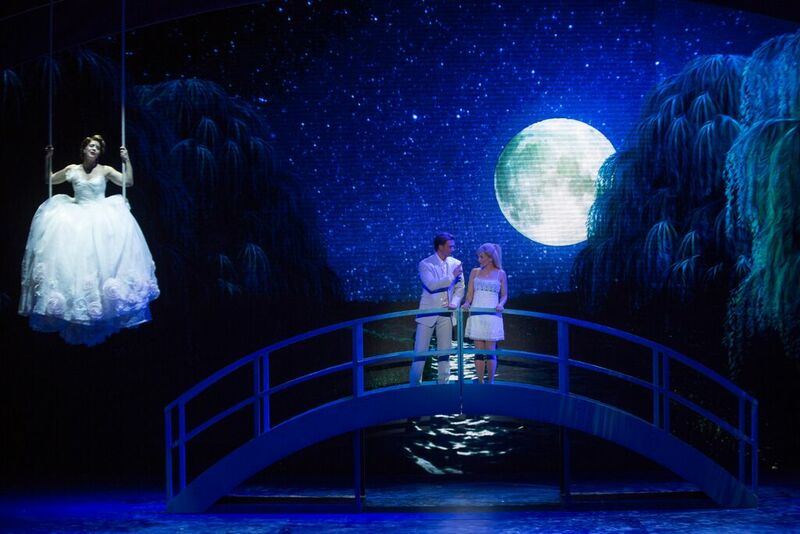 You can’t deny that James Walski’s choreography was his strongest contribution to the project, and with an ensemble of Broadway talent, each number came to life. When it came to the singers, until they appeared together on stage, it’s possible that you assumed David Elder and Joey Calveri were the same person. Obviously they were in the "rabbit hole" number at the beginning, but individually, they both sang the woman-pining numbers. And even Elder and Calveri got into the shirtlessness game. Unfortunately for Walski, the audience cringed long before the Vietnam element of the song. Laurie Wells was stuck with many of the maternal ballads where she was relegated to hitting her spot, standing still, and singing. The sole exception was when she was a metaphor for the moon, swinging on a swing during “Moon River”. As the “Alice” type character, Kelly Felthous brought a nasally vocal. Former Broadway hopeful in the form of a reality star Austin Miller took on the romantic lead role but didn’t quite lead. Thankfully there was some excitement in the main cast in the form of Tara Palsha and Dionne Figgins. Palsha and Figgins have rich vocals and stage presence that transcends time. The production team of Trip of Love was not fooling around when it came to production value. 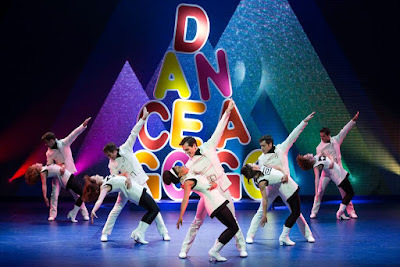 Trip of Love has the feel of a big budget musical with a different set and costume for every number. Co-Scenic designers Walski and Robin Wagner started the atmosphere by transforming Stage 42 completely with the trippy 60s walls. When the stage broke open, each song was simply stunning. Combined with the period-evoking costumes from Gregg Barnes, the spectacle covered up the problematic production. Even though some of his costumes got stuck in a paper shredder, Barnes made each individual look good. Lighting designer Tamotsu Harada went black light galore in his design. It brought a psychedelic feel into the trippy numbers. When the black light wasn’t utilized, Harada offered a concert vibe. Daniel Brodie did wonders with his projection design. They looked fantastic even though they may have been too on point at times. But that was the vision. Walski should be lauded for his choreography. “Wipe Out” was smart and the epitome of fun. “These Boots Are Made for Walking” was flashy and stylized. Walski was at his best during the big, flashy production numbers. But when he tried to get clever, like with the swinging “moon” in “Moon River”, it just was ridiculous. And as a director, he seemed to neglect telling his actors to emote. Beautiful vocals can only go so far in theater. James Walski’s hope is to bring back the musical revue. Sadly the style has left New York to make way for work that is smarter and thought-provoking. Trip of Love should be shopping themselves to Las Vegas or a cruise ship. Had there been a through-line in the journey, perhaps this would be a different story, but in its current form, Trip of Love misses the mark. There’s no need for confetti here.